These days, people are trying to quantify everything, to come up with a number that tells them in simple terms what they think they need to know. It happens in lots of different places. Branch Rickey, the famous baseball general manager, called it putting a “dollar sign on the muscle”. In his case, he was talking about quantifying the value of baseball players for his team. But you probably don’t own a baseball team – if anything, you might be in a position where you manage stored fuel for business use. It might even be “mission-critical” fuel to power backup generators and systems that are essential to your business, customers and/or constituents. You rely on stored fuel to do what you got it for - whether it’s powering mission-critical vehicles and equipment or just being ready to get you through an emergency, whenever that may be. Part of your job may entail fuel housekeeping and management, requiring you to make sure the fuel stays in viable condition. Or you may not be required to pay much on-going attention at all, in which case, your potentially-critical stored fuel is out-of-sight-out-of-mind, waiting for a problem to manifest itself. So what’s the point here? Nobody wants to be hamstrung by problems with their stored fuel, and it’s better to see them coming. In order to do so, you have to have some idea of what your fuel’s condition is like; some idea of the state of your stored fuel’s health. Will your fuel will be ready for when you need it? How would you know? There are clues and signs you could look for, if you knew what they were and what they meant. Clues and signs that can you help “put a dollar sign on the muscle” of your stored fuel’s health. This is where things can get complicated. There are a lot of things to be considered, some mattering more than others. For the typical professional, understanding all of this can be above their pay-grade. Yet they have to try and understand this at a level sufficient to allow them to do their jobs. In understanding all of this, we put together a Fuel Health Check tool to help quantify these issues and give fuel professionals and users better insight on their own situations. You answer a series of multiple-choice questions that all relate the important considerations that may affect stored fuel health. Some are more important or essential than others, but they all play a part. At the end, the Tool generates a score along with recommendations on where your stored fuel’s health likely falls with respect to whether you need to take action or not (and what kind of action that might be). Now you've got a clearer picture of what's going on with your stored fuel. 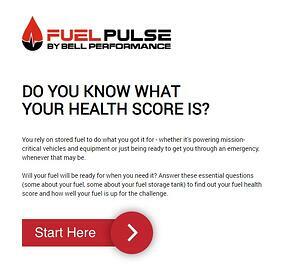 You can find the free Fuel Health Check tool at https://www.bellperformance.com/fuelcheck. If you have stored fuel, it should be a useful tool for you to incorporate into your fuel housekeeping routine. This post was published on March 29, 2019 and was updated on March 29, 2019.